It is with thanks to the Engineering staff at Chelsham Bus Garage that the fleet of buses and Coaches were kept running in all weathers. The sign shown in the picture on the right was fixed to the wall of Chelsham Bus Garage and any drivers who required attention would ring the bell to summon an Engineer. 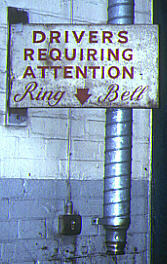 Please Ring the Bell above to go to the Chelsham Engineer's picture album.